Faux Squirrel by Dynasty is made of synthetic fibers that hold as much paint as a squirrel brush, allowing for an even flow of paint. It will continue to hold its shape and will show far less wear over time. This competitively priced brush program is thoughtful in its design: Its seamless crimped ferrules and innovative soft coated handle allows for a sure grip through hours of painting. Faux Squirrel handles have a rubberized coating that feels like rubber to the touch for a comfortable feel and non-slip grip for painting in all conditions. 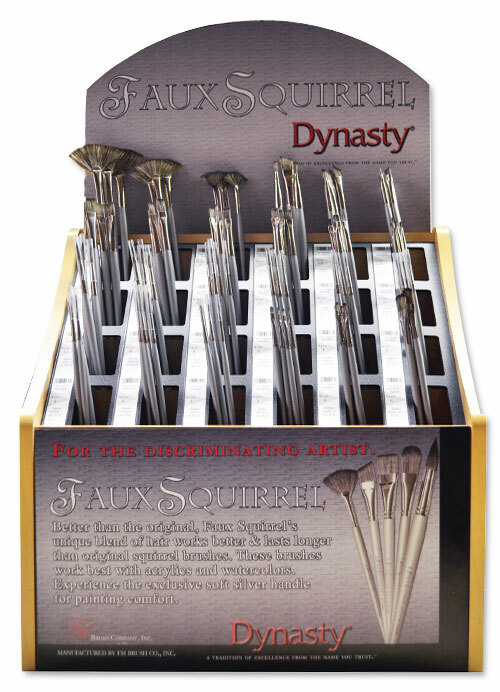 Purchase Dynasty Faux Squirrel Brushes At These Fine Retailers!